Family Physician Robert Westin, M.D., has practiced at Cuyuna Regional Medical Center’s Crosby Clinic since 1995. He has special interests in diabetes, pediatrics, and sports medicine. 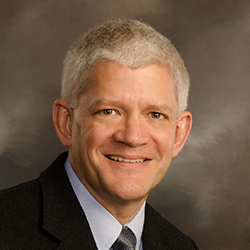 A Board Certified Family Practitioner, Dr. Westin is a member of the American Academy of Family Physicians and serves at Cuyuna Regional Medical Center’s Chief Medical Officer. He received his undergraduate degree from Bethel College in St. Paul, Minn., did the Rural Physician Associate Program in Cambridge, Minn., and graduated with his Medical Degree from the University of Minnesota School of Medicine-Duluth and Minneapolis. He completed residency with the Duluth Family Practice Program in Duluth, Minn., before beginning practice in Crosby. Dr. Westin and his wife, Sharri, live in Ironton with their two sons and three daughters. Outside of his practice, Dr. Westin enjoys his family, outdoor activities (fishing, hunting, boating), music/piano and church activities. He is also a member of the Christian Medical and Dental Association.